WHAT A RADICAL DIFFERENCE EMOTIONAL INTELLIGENCE MAKES! With this extraordinary benefit, we’re happier, more productive and successful. We love and help others more effectively. Our health likely improves as well. Without it, our emotions so often defeat us. We worry incessantly about catastrophes that never occur. We lose our temper easily. We cave in to despair over a setback, missing any silver lining. We give in to the urge to rescue someone, when we’re already overextended. We tire unnecessarily. The emotionally intelligent person is far less susceptible. She understands her feelings well, and handles them adeptly. He also knows how to draw many benefits—even from his negative emotions. 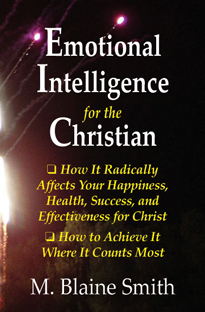 In this warm and insightful book, Blaine Smith looks carefully at what emotional intelligence is, and why it’s vital for the Christian. He explains how you can achieve it, offering much practical counsel, and drawing on many fascinating biblical and personal examples. He looks at issues common to everyone, and at many unique to us as believers. The goal of growing wiser emotionally is highly achievable for any of us who take it seriously. This book will give you both the inspiration and practical guidance to make it happen! M. Blaine Smith, a Presbyterian pastor, is author of ten books, including Knowing God’s Will, The Yes Anxiety, and Overcoming Shyness. He is director of Nehemiah Ministries in the Washington , D.C. area.